The Big Game comes with big appetites. Rooting for your favorite team, yelling at the officials, fist bumping after great play – it all makes a football fan downright hungry. So let me help by sharing a recipe that has always been a crowd pleaser, especially for a day as big as Super Bowl Sunday. 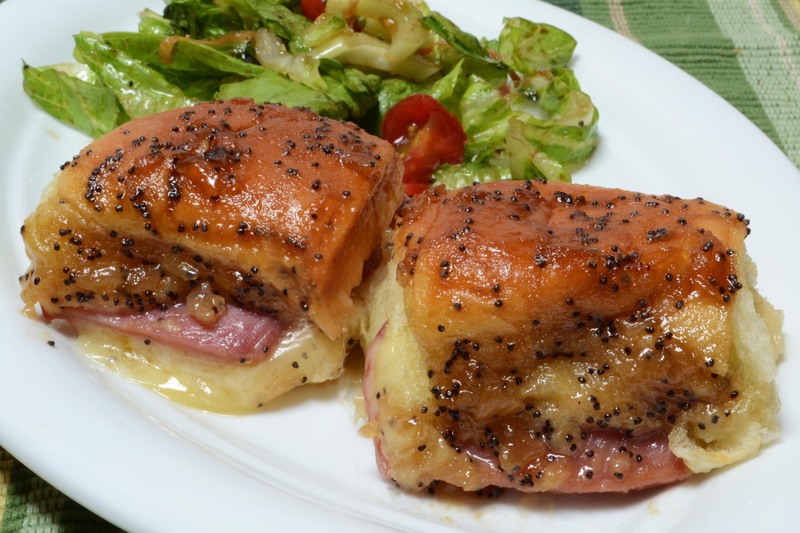 Caramelized Ham and Swiss Baked Buns tends to resurface every few years, with new, updated variations on the theme. Basically what you have here is a casserole of hot sandwiches filled with ham and cheese and a sauce poured over the top. No, no. That’s not quite accurate. What you really have here is a slightly sweet billowy bun with a little slather of horseradish sauce, onto which black forest ham and swiss cheese is layered, and then a sweet and savory butter sauce does its magic in the oven. The tops of the sandwiches get caramelized and glazed, the cheese inside melts and melds with the horseradish sauce, and you find yourself in a situation where you just can’t pass one up. Yep, that’s a much better description. Now, as I’ve said, there are many versions of this recipe including potato or dinner rolls, but the classic version is the Hawaiian sweet rolls. The original recipe also calls for ham and swiss cheese for the filling, but substitutions have included turkey or pastrami. Also, horseradish sauce is often substituted for butter or mayonnaise. But I say, why mess with a good thing? Folks love this dish, and when you make it for this weekend’s big game, you’ll see why. Slice each bun in half, or take a serrated knife and cut the entire loaf of Hawaiian rolls horizontally. Lay bottom half in a 9" square pan. Spread roll bottoms with horseradish sauce. Layer with ham and cheese. Replace tops. In a small skillet, heat butter over medium high heat. Add onion, cooking and stirring for about 3 minutes, or until tender. Add brown sugar, mustard, poppy seeds, Worcestershire sauce, and garlic powder, mixing until sugar has dissolved. Pour over rolls. Refrigerate, covered, for several hours or overnight. Bake at 350ºF covered, for 25 minutes. Uncover and bake 8-10 minutes longer, or until golden-brown on top. Vigorously mix ingredients together and refrigerate until ready to use.